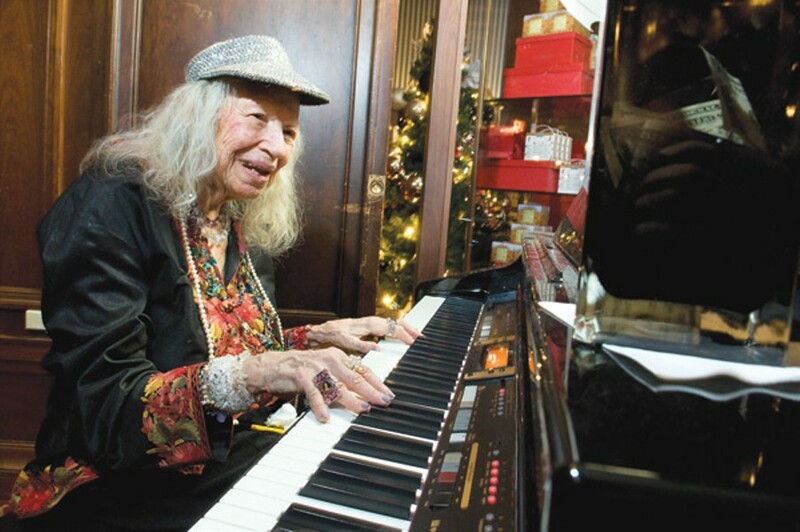 If you ever ate at Big Shoulders Cafe, the restaurant that used to occupy a bay-windowed corner of the Chicago History Museum, you've probably heard Roberta Brown play the piano, because that used to be her gig. When she reminded me of it, I remembered how intense the music was there, how the sound reverberated off all the hard surfaces. She says she got that job after she walked in one day to pick up a couple of Latin School kids for their private lessons and couldn't resist the unoccupied piano. "They never let me leave," she says. "I was there every day for lunch, for 12 years." The restaurant didn't pay her, but it fed her, and she brought in her own, much better piano—an 1894 Collard & Collard concert grand ("Elton John has the only other one," she claims). But then in 2005 "they had a $27 million renovation and there was no more music and no [real] cafe." Even though the museum eventually opened the North & Clark Cafe in the same space, the Collard & Collard concert grand remains parked with a friend who has a roomier apartment than hers. But you can still hear Brown play. Her new venue is the Walnut Room at Macy's, which is where I introduced myself to Brown. I've pretty successfully avoided Macy's since it ousted Marshall Field's in 2005, but on a recent Sunday afternoon I had my favorite nine-year-old in tow, and a nine-year-old's December only comes around once. Damned if the old store didn't look spectacular, all gussied up for the holidays in sparkling silver and Macy's blazing scarlet. Macy's has struggled on State Street, where a dauntless band of boycotters has been handing out flyers and buttons on weekends. But the wait for a Walnut Room table was an hour and a half. We settled for seats at the adjacent wine bar, with a partial view of the 45-foot tree and the fairy princesses in silver gowns and tiaras who were working the room. It was alive with a festive buzz, and with the anthems of the season coming from what looked like a baby grand piano. The woman at the keys looked like somebody's granny, or maybe Mrs. Claus, her long white hair topped with a sequined visor and her belongings—coat, shopping bags—stashed nearby, as if she'd just come in off the street. A tip jar was perched prominently on the piano's lid. "Is that a customer?" I asked our server, who told us this story in response: There used to be a piano dealer in the store who loaned the shiny grand to the Walnut Room for special events. Then the store was sold and the dealer left, but the piano was still there. The staff thought the dealer had forgotten it, and called to remind him. That's when they learned to their surprise that Brown had purchased it to give to the store. "She bought it for the Walnut Room," said the server, "and we let her play it whenever she wants." Brown is an octogenarian and a lifelong Chicagoan. Her mother emigrated from South Africa, her father (who became a successful men's shoes wholesaler) from Poland, and she and her younger brother were raised in a six-flat in Wicker Park. One side of the family was seriously musical, and the children were sent to the American Conservatory of Music in the Loop for lessons. Brown took piano there three times a week from the age of six. When it came time for high school, she took the train to Austin High because it had the best music program in the city. She went downstate to the University of Illinois for two years, then transferred to Roosevelt University's Chicago Musical College, where she studied with pianist and conductor Rudolph Ganz. By the time she graduated she had enough piano students of her own that she didn't need to look for a job. She was in her early 20s when a mutual friend introduced her to "a fine young man from a good Hyde Park family." They kept company for about a year and then announced their engagement. But with plans under way for a big wedding at the Ambassador West Hotel, the bride began to think better of it. The daughter of a great cook, she'd never done anything in the kitchen and didn't want to. She saw herself as a professional, not a domestic. And then there was the family thing: "I love children," she says, "but I knew I'd rather teach them than raise them." Three weeks before the event, with invitations out to 300 people, she called it off. And though there've been other people in her life since (Irv, the steady for 12 years; Arthur, the orthodontist who moved to San Francisco), there's never been one she wanted to live with. She moved into an apartment in the Imperial Towers on Marine Drive when it opened in 1962 and she's lived there solo ever since. Nearly half a century, she says, and "my oven has never been turned on." Don't waste your time thinking that might be a little lonely: Brown says her life has been completely happy and totally stress free precisely because there were no husbands to deal with or children to raise. And except for a little bout with skin cancer a decade or so ago that forced her to give up her daily bicycle trips downtown, she's been the picture of health. She chalks that up to vitamins and good eating: a sugar-free, salt-free diet also recently divested of white flour and pasta under the guidance of her friend Victor—nutrition maven and 34-year Lincoln Park doorman. It couldn't have hurt that she's never worked for anyone but herself, and that the only work she does is what she loves: teaching the piano and playing it, along with a little fashion design, garments in her own glitzy style made for her, she says, by "artists" in India or Italy that she sells to people she knows. Never interested in becoming a concert pianist ("They have to practice 14 hours a day. It's a very introverted life," she says), she plays weddings and parties in the city's private clubs and homes; among the most memorable, she says, was the 80th birthday of former CSO conductor Georg Solti. Her adult students have included the likes of John Marshall Law School professor Ronald Smith, who says he told her up front that he wanted to play Scott Joplin and then they set out on a decade of Czerny and Bach. Brown says the piano she bought for the Walnut Room is actually digital, designed to look and sound like a traditional grand but more affordable. She's not sure what her hours will be after the tree comes down January 11, but till then, from about noon to 3 PM weekdays and 11 AM to 4 PM Saturday and Sunday, you'll find her there.